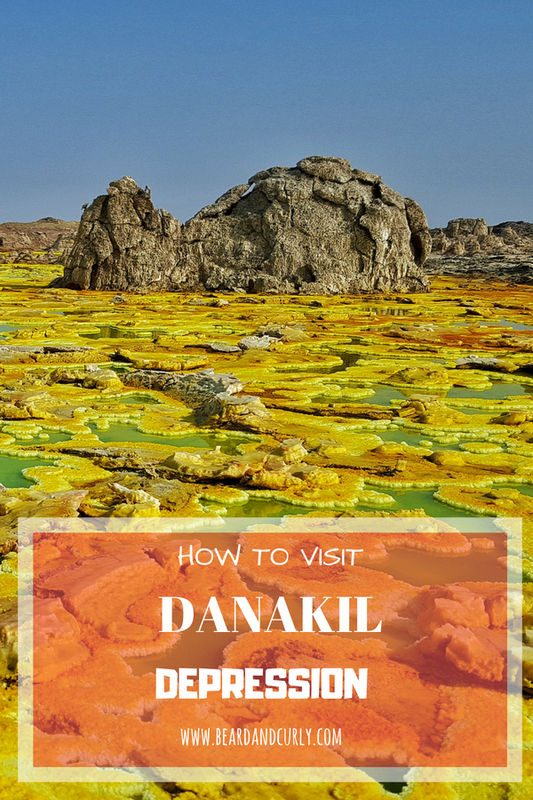 The Danakil Depression is located in the Afar region of Northern Ethiopia. This region is not far from the border with Eritrea. 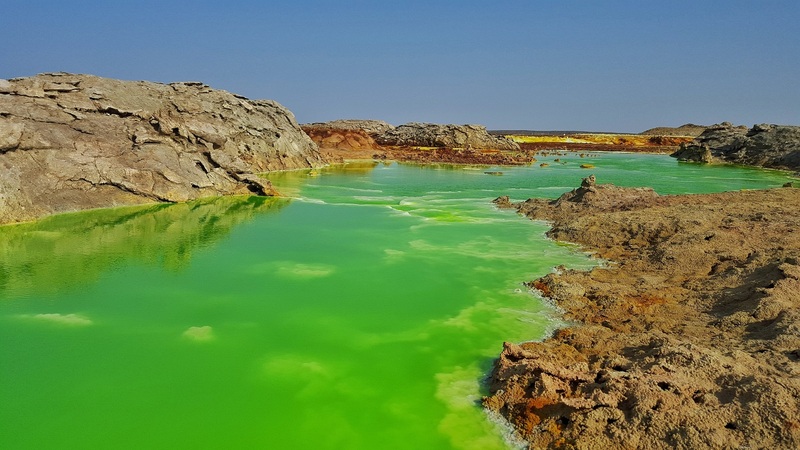 Filled with active volcanoes, a permanent lava lake, sulfur lakes, and camel caravans, there are many reasons this is the top tour destination in Ethiopia. 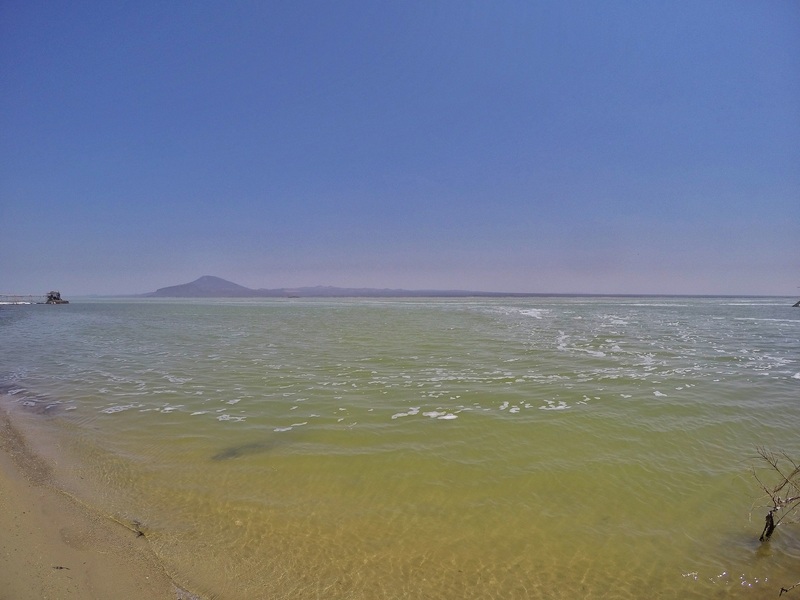 Located 125 meters (410 feet) below sea level, this one of the lowest places on earth. Temperatures soar over 120 degrees Fahrenheit. 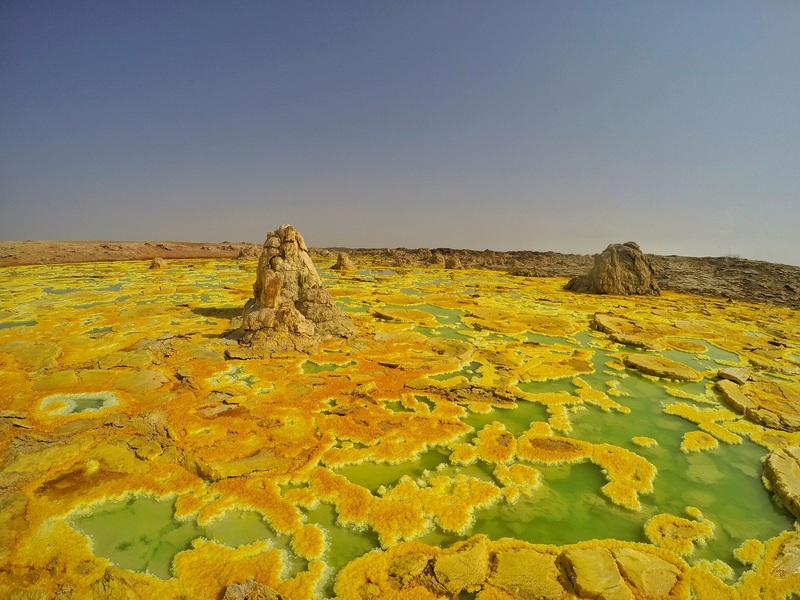 The bizarre landscape of the Danakil Depression is reason alone to visit Ethiopia. Safety is of concern in this region of Ethiopia. Eritrea and Ethiopia have been at war, or on the brink of war for decades. There was an ambush by Eritreans at the Erta Ale volcano in January 2012, where five tourists were killed. A German tourist was shot and killed in December 2017, although the clarity of these events seems to be unclear. As a result of these instances, the Ethiopian military has strict government requirements to visit the area. Only sanctioned tour groups can go, and on certain parts of the tour, there are armed military and police convoys with you. We felt safe due to the presence of military with us, however, we wanted to be clear about the safety concerns which everyone should be willing to accept before going on this tour. The three or four-day tour is very rugged. Transportation is in a standard 4×4 Toyota Land Cruiser. This tour has more car time than I would prefer, but to get to these remote locations take time. The food was surprisingly pleasant; however, the rest of the tour is very basic. For two nights, the group sleeps outside on old thin mats. One night is luxuriously (kidding) indoors, in nothing more than an empty room with that same old thin mat. Toilets are long forgotten. This tour is not for everyone. 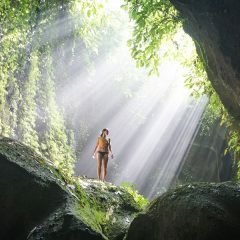 With that said, it is one of the most fascinating places we have ever seen. Book with Ethio Travel and Tours (ETT). Call Abeba in Mekele at +251 91 402 7893, or email at [email protected]. Ask about their free shuttle transfer from Aksum or Lalibela. Typically the tour is four days, there is an option for a three-day tour. Tours all begin/end in Mekele. Groups could be anywhere from just one vehicle to a several vehicle convoy. 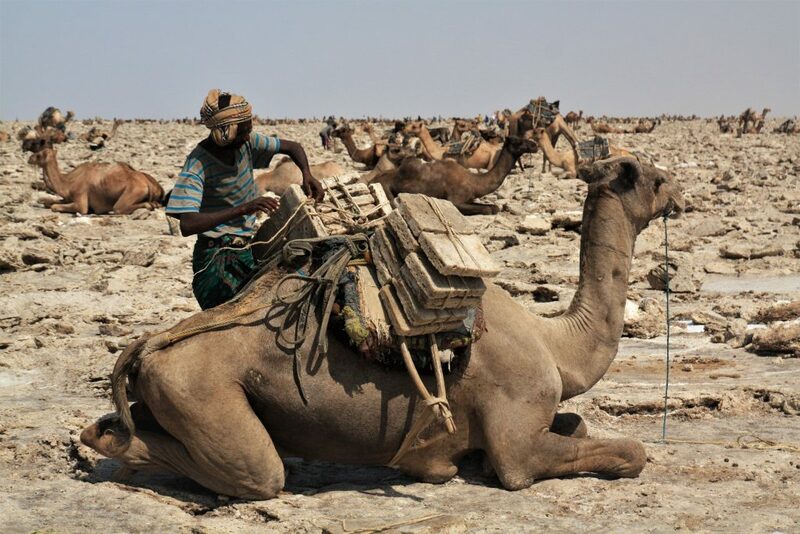 A three-day tour would drop the camel caravan, Lake Assale, and the salt mining production. While these things are not the two main highlights of Erta Ale and Dallol, they round out the trip. With the amount of travel time, I would prefer the extra day to see these sites. Different departure days take different routes, so the daily activities may alter the below example itinerary. Mostly a driving day to Erta Ale volcano. The drive lasts 6 hours with a few stops. The last hour and a half is a very bumpy road through lava fields. After dinner, there is a night hike to the volcano rim (4 hours). Groups get around 2 hours to walk around and view the lava lake, one of only five in the world. 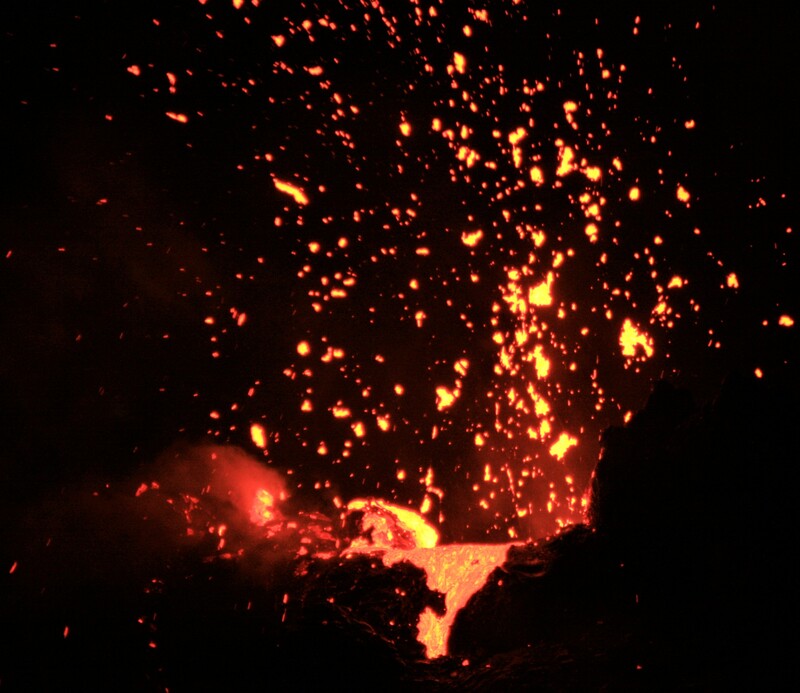 Depending on the volcanic activity, it is possible to get 10 meters from the lava lake. If eruptions recently occurred, they will not allow you to get too close. In this case, it is hard to see the lava, which happened to us. The camp is set up near the summit of Erta Ale on basic mats as you sleep under the stars. After an early hike down the volcano, there is a stop at Lake Afrera. Although not super impressive, it is nice to float in the warm salty lake and relax in a hot natural spring. Afterward, the rest of the afternoon is free in Aba’ala. This is the one night where you stay indoors, at a basic local guesthouse. 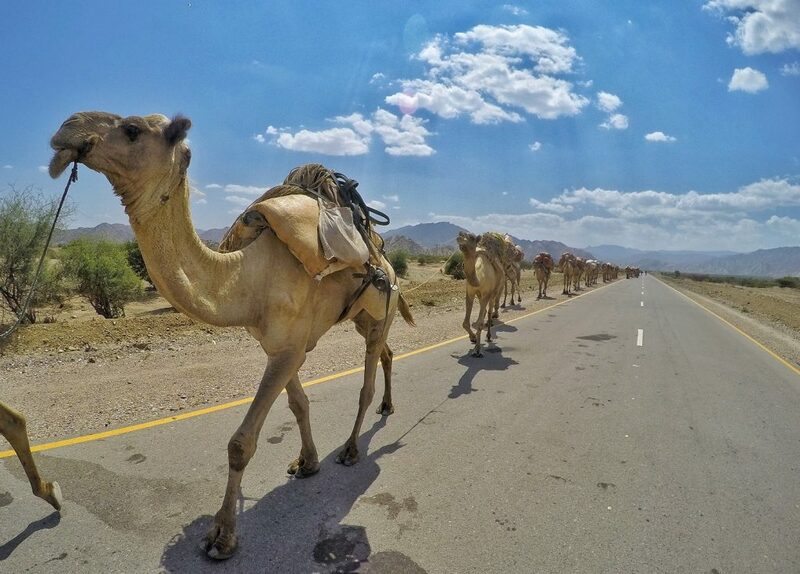 Mostly a driving day, there is a scenic drive over mountain passes on the way to the Afar region, close to the border with Eritrea. After lunch, stops include the camel caravans and sunset at Lake Assale. After sunset we head back to camp at Hamadela, where the group sleeps under the stars. The highlight of the trip is Dallol. 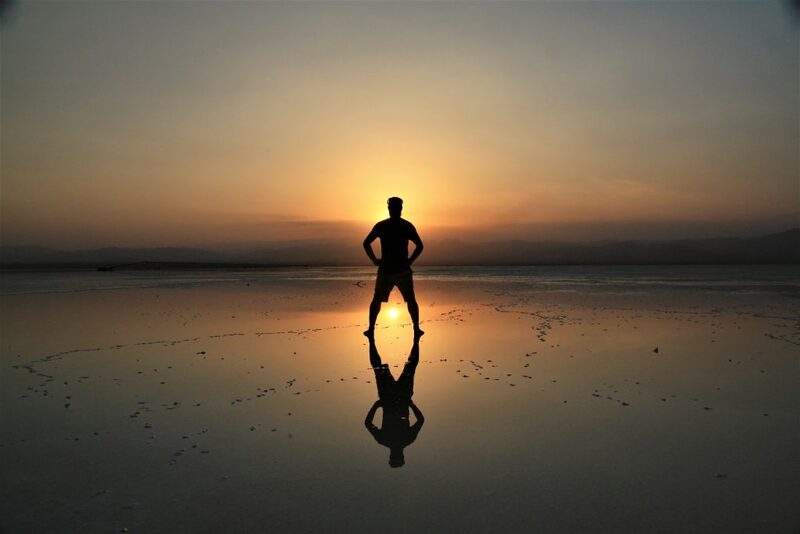 At one of the lowest and hottest places on earth, the tour to this area will start early to beat the sun. 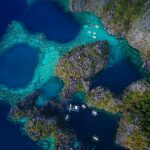 There is over an hour to explore the sulfur lakes and amazing colors. This was our favorite part of the tour. 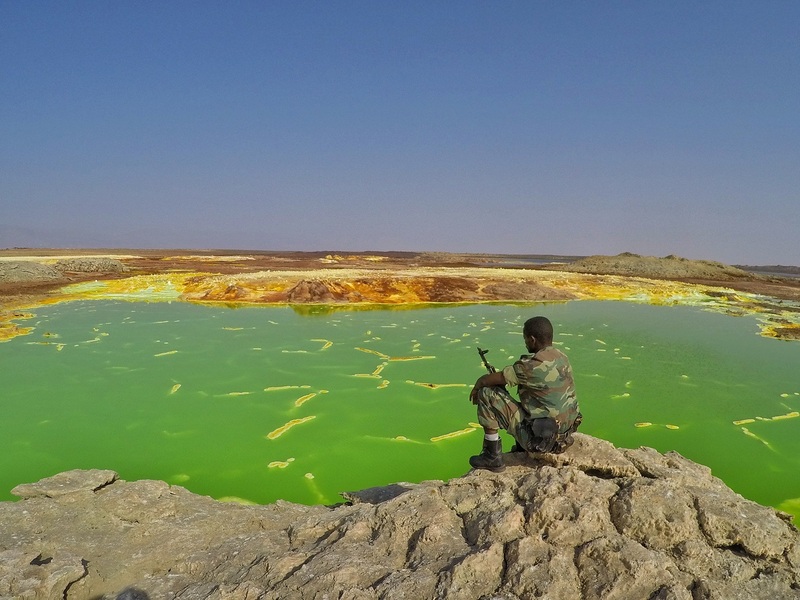 After Dallol, other stops include Salt Mountain, the Yellow Boiling Lake, and Lake Assale to see salt mining production. The tour ends with a long drive back to Mekele. 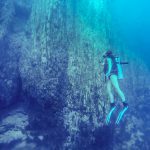 Tours are priced in USD, and quotes start as high as $600. Don’t book this tour in advance. Tours leave several times a week, and always have room for last-minute bookings. Book in Ethiopia and negotiate a price down to $350 per person. LK Pension has ensuite double rooms for 300 Birr and shared bathrooms for 200 Birr.